Fallout 76 mixes up the established formula quite a bit, and not just because of multiplayer. 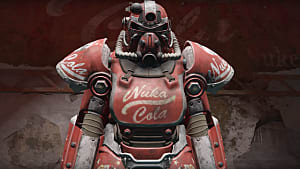 The perk system works very differently than it did in the previous Fallout 4. Perks in this game work by equipping perk cards, and they can be swapped out. They are also directly tied to your S.P.E.C.I.A.L. stats, so you need to be careful how you spend them. Perks can also have multiple ranks and different costs. 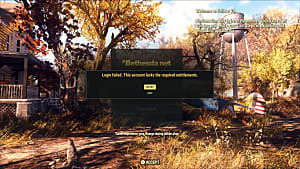 There is a lot to the system that may not be apparent at first, or confusing, so I'm going to fully explain the perk system in Fallout 76. 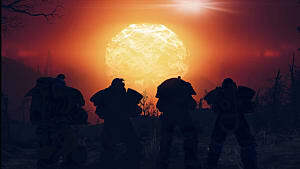 Let me first explain the basics of S.P.E.C.I.A.L. and perks in Fallout 76 and how they differ from Fallout 4. There are seven categories you can put stat points in. You start off with one in each, and receive one every time you level up. These level up points can be spent on any of the seven stats. Strength - Increases carrying capacity and melee attack damage. Perception - Increases weapon accuracy in V.A.T.S. and your ability to detect stealth. Also gives the ability to pick locks. Endurance - Increases total health, lowers AP drain from sprinting, and increases your resistance to diseases. Charisma - Lowers prices from bartering, lets you share perks with others, and increases rewards from group quests. Agility - Increases your AP in V.A.T.S. and your ability to sneak. Luck - Increases the recharge rate of critical hits and the condition and durability of items you loot. In Fallout 4, you got some points to use at the beginning and could get more from leveling and finding bobble heads. 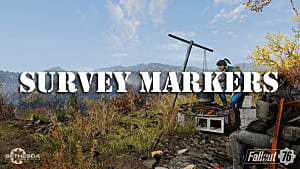 In Fallout 76, you only start with the initial one in each stat and cannot permanently increase them with bobble heads. You only get them from leveling until level 50. This means you have 49 points to freely spend, plus the 7 set points you get at the beginning. Perks do a wide variety of things. 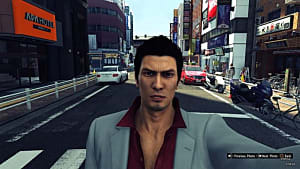 They can increase damage of a certain weapon, allow you to hack or pick locks, increase defense, and much more. 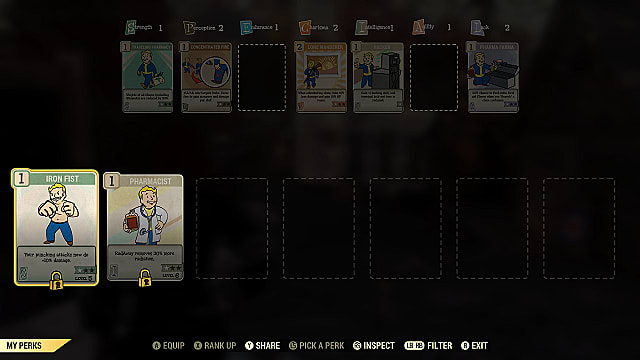 Fallout 76 lets you choose which perks you want via perk cards. Each card correlates to a specific stat and has a cost, which is the number on the top-left corner of the card. Some cards also require you to be a certain level before you can equip them. Your stat in that perk's category, must be at the same number or higher than the card's cost. For example, if you have a Strength perk card that costs 3 points, your Strength must be at least 3 in order to use it. Each stat can only be increased to a maximum of 15. Also, there are no perk cards that cost more than 5 points. Since you cannot currently reset your points, you must choose wisely. You can also hold off from putting in points if you aren't sure at the time. You can equip as many or as few cards as you want for each stat, as long as they don't go over your current limit. The best part is that you can unequip any perk card if you want to use different ones. 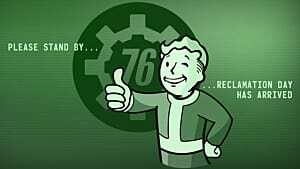 This is something you could not do in Fallout 4 without using console commands or a mod. When you level up and select a stat to increase, you will be able to choose one new perk card as well. You can select a new one, but you can also select one you already have. If you select an existing card, this will allow you to rank it up. More on that soon. 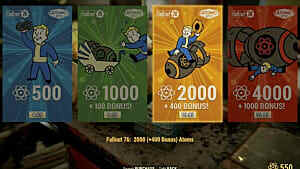 Starting at level 4, you will get a perk card pack every other level until level 10, then every 5 levels after that. Perk card packs give you 4 random perk cards. If you choose or receive a perk card that you already have, you can use it to rank up the perk. 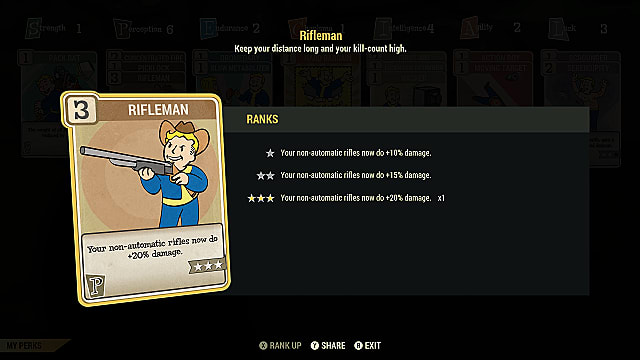 Take the Rifleman perk card for example. 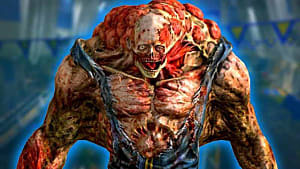 It is a Perception perk that allows you to deal 10% more damage with non-automatic rifles. At the base level it costs 1 point. If I get another one, I can combine them to increase it to rank 2. This will increase the damage bonus I get, but now it costs 2 points to use. Keep this in mind when ranking up perks because you will need to also increase your stat or remove other cards if you want to continue using it. If you play with others, you can also share your perks if you have a high enough Charisma stat. For every 1 point a perk costs, you need 3 Charisma to share it. So a 1 point perk requires at least 3 Charisma to share and a 5 point perk requires the maximum of 15 Charisma to share. 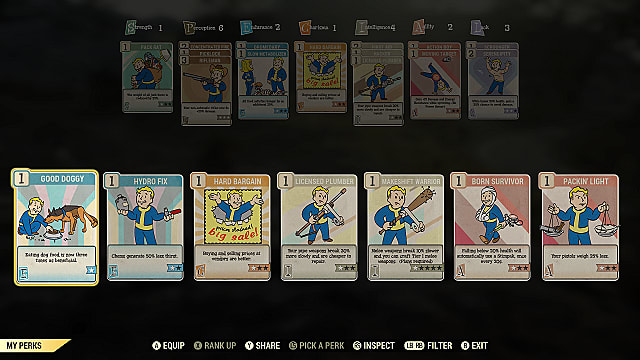 That's everything you need to know about the perk card system in Fallout 76. Let me know if you have any questions, or need further clarification on anything! 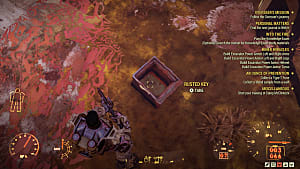 Be sure to check out our other Fallout 76 guides, so you don't miss out on any wasteland action!